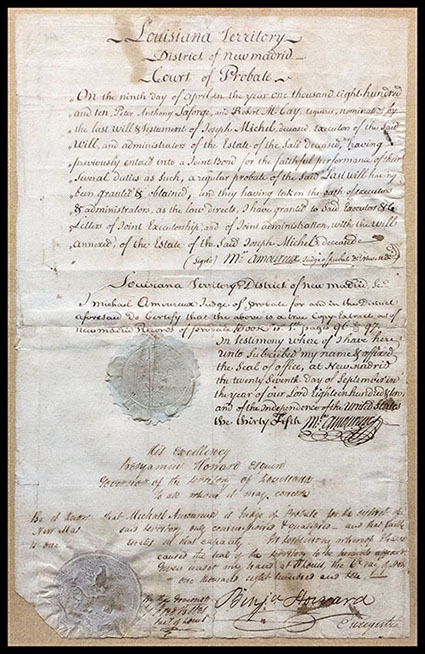 1810 Louisiana Territory Probate Court Document, framed document for the District of New Madrid, signed by Frederick Bates as Secretary of the Louisiana Territory, F.-V.F. Frederick Bates (1777-1825), was an American attorney and politician. He was elected in 1824 as the second governor of Missouri and died in office in 1825. Before that he had served as a Justice of the Territorial Supreme Court for Michigan Territory, was appointed by Thomas Jefferson as Secretary of the Louisiana Territory and started to build his political base in St. Louis. 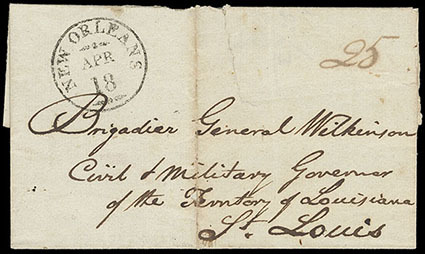 New Orleans, Apr 18, neat strike of cds and manuscript "25" cent rating on 1806 folded cover to Brigadier General Wilkerson, Civil and Military Governor of the Territory of Louisiana at St. Louis Mo., inside docketed from Daniel Clark; cover tear and toned fold, Fine and early Louisiana Territorial use. Daniel Clark (1766- 1813) was the first Delegate from the Territory of Orleans to the United States House of Representatives. James Wilkinson was born in Benedict, Maryland in 1757. He enlisted in the Continental Army under Washington. Closely associated with Benedict Arnold and Aaron Burr, he was directly implicated in Burr's scheme to establish a southwestern empire. He went to Kentucky shortly after the Revolution and obtained from the Spaniards an exclusive right to trade with New Orleans, which according to one writer "was the betrayal of his country." After reinstatement in the Army is 1791, he served under Anthony Wayne in the northwest and succeeded to the command when Wayne died in 1796. Even though the cloud of secret dealings with the Spanish still hung over him, he nevertheless was named Governor of Louisiana Territory immediately after its organization. In 1811 he was court-martialed for conspiring with Burr, but two years later he was promoted to Major General. He was discharged after the War of 1812 and died in Mexico in 1825. Long after his death documents in the Spanish archives were discovered proving that he was a Spanish secret agent while serving in the U.S. Army. 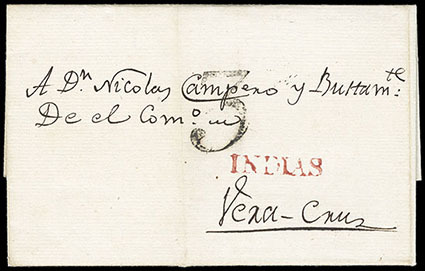 Nueva Orleans, 21 Junio, 1813, folded letter addressed to Veracruz, Mexico, carried to Havana and entering the mails in Cuba with small red "Indias" straight line handstamp (P.E. 37) and black "3" reales due marking as stipulated by the 1812 tariff for an unpaid single weight letter, Very Fine and choice, only four items are recorded with this small "Indias" Cuban postmark used before 1821 and quite remarkable on mail originating from Louisiana. Nueva - Orleans, 1 Julio En 1813, dateline on folded letter written in Spanish, to Veracruz, Mexico, manuscript "Goletta Proserprina" schooner endorsement at lower left, with "3" reales rate marking for an unpaid single weight maritime letter, matching "Yndias" straight-line handstamp, Very Fine and choice, The "Yndias" handstamp is identical to the type previously used in New Orleans. 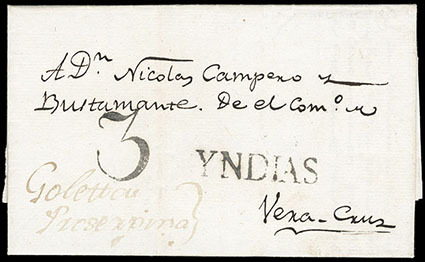 Since the post office was closed with the end of the Spanish dominion in Louisiana in 1803, this postmark most likely was taken to and used in Havana, ex-Kouri; with 2014 Comex certificate. AN EXTRAORDINARY USAGE OF THE "YNDIAS" HANDSTAMP OF NEW ORLEANS APPLIED OUTSIDE THE CITY. 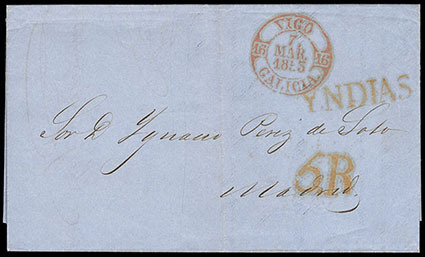 New Orleans, 1 de Feirero de 1853, dateline on folded letter to Madrid, Spain, with distinct red "Vigo, 7 Mar, 1853" transit cds, red "Yndias" straight line and matching "5.R" rate handstamps applied upon arrival in Madrid, Very Fine, this extremely rare "Yndias" postmark of Madrid has not been reported in any catalog. 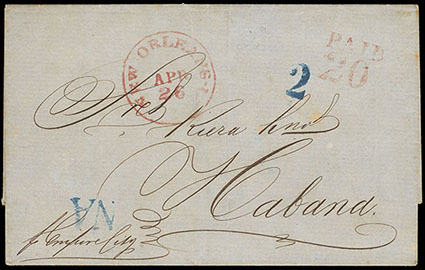 New Orleans, Abril 25/ 1853, docketing on folded letter sheet to Havana, Cuba, red "New Orleans, La., Apr 26" origin cds and matching "Paid 20" handstamp, manuscript Reverse: ship endorsement, blue "2" due and "NA" handstamps applied upon arrival. 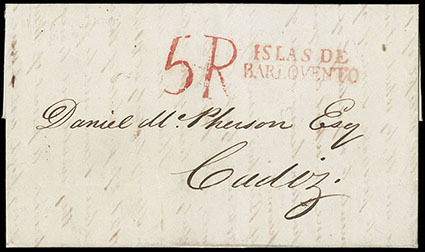 (Maryland) Balto, 1 July, 1841, dateline on folded letter to Cadiz, Spain, most likely carried via Havana with involvement of forwarding agent in its carriage as indicated on reverse, with red "Islas de Barlovento" two-line handstamp (P.E. 3) applied upon arrival denoting origin from the Caribbean region, with red "5R" due rating alongside, Very Fine and choice, a very scarce usage in this period sent to Spain. (Maryland) Georgetown Md., 1775 (Jan. 31) to Philadelphia Pa., mostly clear strikes of "GEORGE*TOWN*S" and "JAN:31" separate town and date straightline handstamps on reverse of folded letter datelined "Georgetown Jany. 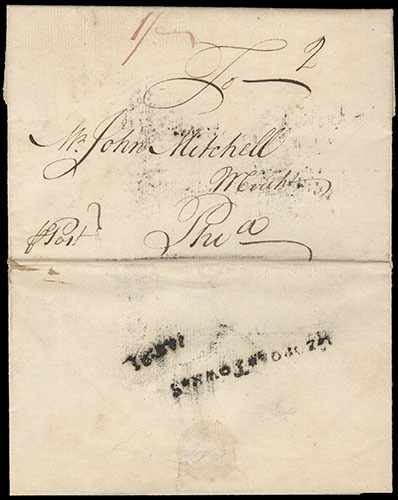 31st 1775" to Philadelphia, manuscript "2" dwt rating and magenta "1/-" in local currency (2dwt=6p x 1.67 inflation factor=10p plus 2p carrier fee or or 1sh), Very Fine and rare, ex-Hahn. ONE OF ONLY THREE RECORDED EXAMPLES OF THE COLONIAL GEORGETOWN STRAIGHTLINE POSTMARK. Although the "GEORGE*TOWN*S" straightline was once thought to be from South Carolina, it is now generally accepted that the marking was used at Georgetown, Maryland, shortly before the transition from the British Parliamentary Post system to the Congressional Post. (Massachusetts) Boston Mass. to Newport R.I., 1750 (Jul. 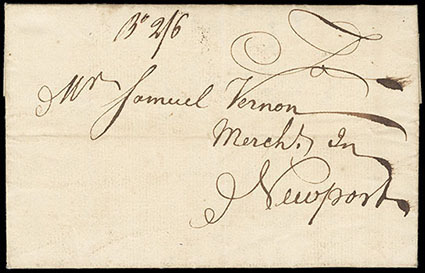 9), datelined folded letter from the Vernon correspondence with manuscript "Bo 2/6" postmark, Very Fine; with 2003 P.F. certificate. (Michigan Territory) "Detroit 7 March", red manuscript postmark with matching "Paid 25" rating on folded letter to Hon. 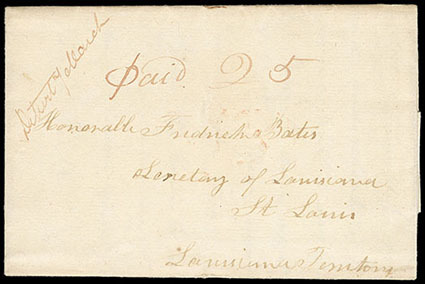 Frederick Bates, Secretary of Louisiana, St. Louis, Louisiana Territory from a friend Alijah Hull congratulating him on his recent appointment to administer the Government of Louisiana Territory after recently leaving Detroit, and inquires "…I know not wheather the Surveyor General has appointed a principal Deputy in Louisiana or not if he has not and I could obtain the Office I should like to come there - I have a much better opinion of that Country than this - I think the emigrations into that Country will be very great…", Very Fine and rare early Detroit Territorial letter, ASCC $850.